Fantastic! I'vwe been dying for Google to put in the South African street network. Including the excellent T4A data is certainly a step in the right direction! I'm not seeing the historical maps in my layers, but I do see the other new ones. Am I missing something? You need to open the "Rumsey Historical Maps" folder and turn on one of the options. It is a "radio button" folder which means only one map can be viewed at a time. Or, when you are done, you can select "Turn Maps Off". I think you also need the newest version of Google Earth. No folder, no radio button to turn. Can you show a screen capture to show us where is the folder? Had the same problem, until i changed Tools>Options>General>LanguageSettings to "English". 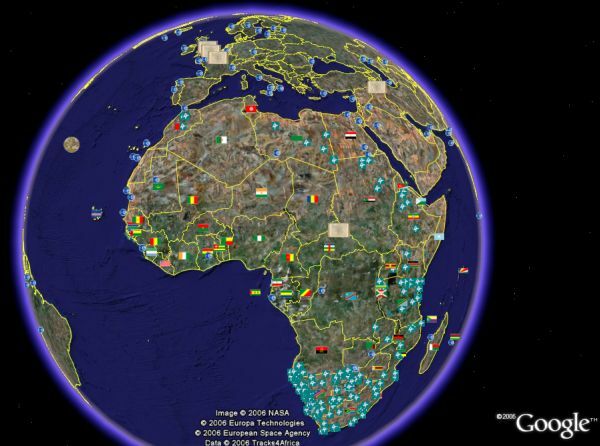 You'll need to be running the latest version of Google Earth 4 Beta (from November 1st). Thok, I have a mac version... Impossible to change the language. Jonathan, I just checked with Google. Try downloading GE again. The Linux version was updated on November 1st as well. In the Mac version you have to open the "Featured Content" folder under "Layers". you will see the Rumsey Collection and much more there....Cheers. - It works only with the PC version. - Impossible on Mac or Linux. - Only with English version. - Impossible to change language on the Mac version. So, go back to work, guys, and finish the job. I just confirmed the Rumsey maps do work on the Mac (at least on my English version on a MacBook). I'm using version 4.0.2413 of GE (free version). The Mac version works fine on my PowerBook G4. I am running Tiger 10.4.8 and Google Earth 4.0.2413 (beta). Google/View/Sidebar; Layers, Core, Rumsey Historical Maps. [radio buttons]. London in 1843 comes up beautifully. the Linux version works here. I also don't see it on a Mac, v. 4.0.2413 and in German. No way to change language. want to have historical maps! "Rumsey Historical Maps" doesn't work on my Windows XP Home Edition PC unless you are logged on with an Administrator Account! I just wish they'd spell the name of my country properly - That's "Solomon Islands" not "Soloman Islands" if anyone from Google is listening.